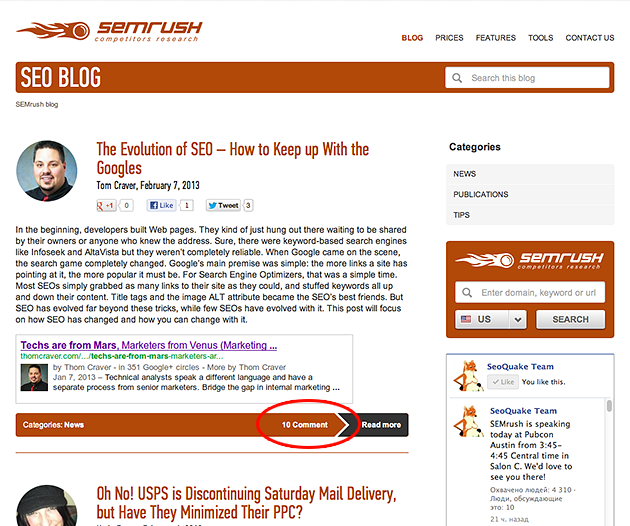 We are thrilled to announce the creation of a new SEMrush Blog! This new blog includes the ability for you to leave comments as well as social media sharing buttons. The purpose behind its creation is to attend to YOU, our precious customers, while providing insightful communication highlights. We would like to conduct a dialogue with existing and potential customers to provide the latest corporate updates, news, innovations, and so on. What is also important to us is that we are able to see your questions. We are very open to our customers and are more than willing to engage in a dialogue with our users! We do not bank only on our brand names but we also post public guest articles and cover a wide range of topics to make the blog a virtual repository of interesting and practical information. We are open for publishing lengthy and useful content that is original and not commercial. We have even prompted many users to share and link back to them. Within the SEMrush Blog you also will see the photos of some company employees who were involved in the news updates as well as those who write and post articles. NEWS. This includes the latest activities of the SEMrush Team as well as new features. PUBLICATIONS. These are reviews of the market where we are publishing articles of exclusive and not advertising content. Everyone is welcome to help fill our blog. TIPS. Professional tips form SEO world. Here are analytical articles which are adapted to practical examples. We hereby invite you be a regular reader of the SEMrush blog so that you can gain insight into what it is to live the SEMrush Team life and learn about current web world news. We hope that you can help to make our blog come to life and ask that you leave comments on various issues. Let’s make it happen together!